Huckleberry Finn’s pal Indian Joe would have gobbled these down in two shakes of a deer’s tail. I received an envelope containing February’s shipment of spices from Raw Spice Bar, to do a review of their product, but all opinions are strictly my own. Sloppy Indian Joe Sandwich? What’s that? Anybody remember the character Injun Joe, from Mark Twain’s famous novels, The Adventures of Tom Sawyer, and Adventures of Huckleberry Finn? This recipe for my sandwich, the Sloppy Indian Joe, has absolutely nothing to do with him. But read on, anyway. The sandwich recipe is worth it! Let’s face it: Sloppy Joes can be boring kid food. But what if we took something that most of us remember from childhood (and probably have lost our taste for…because…well…they’re boring…) and put a whole new spin on it? What if we used freshly ground Indian spices that would really awaken our senses? And what if we turned that boring old Sloppy Joe into a sandwich that was kind of spectacular. 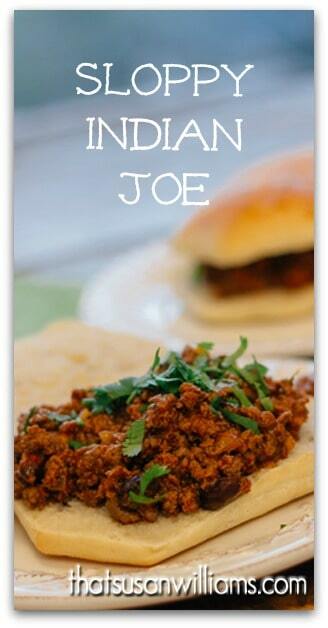 Why not give it a fun name like the Sloppy Indian Joe? It should be no surprise to anyone that I love cooking. Cooking utilizes both sides of my brain. Cooking takes knowledge that I’ve gained through the academic disciplines of science, chemistry, and math and combines that knowledge with true artistry, creativity, and intuition. Cooking involves all my senses: visually, my eyes feast on the bright colors of the ingredients, my fingers sense the feel of foods as I prep them, my ears enjoy the sounds as ingredients begin to sizzle in the pan, or crunch between my teeth, and the taste: oh, the heavenly taste, when all the right elements come together and are perfectly balanced. The one sense I omitted in my description above is a critical one. Without our sense of smell, we’d lose much of the flavor in food. And very often, some of the strongest aromas in cooking come from the spices that we use. These are the spices I received in the February shipment from Raw Spice Bar. In my opinion, their idea is genius, due to the speed at which the spices we buy from the grocery store tend to lose their aroma. (We’re supposed to be replacing our spices about every 6 months, or at least once a year. If you open a jar of spice, and you aren’t immediately hit by the aroma, you’re holding a lack of flavor in your hands.) The quantity of spice that Raw Spice Bar mails you may be small, but in this instance, the phrase “small, but mighty” is apropos. My packet of spices contained a recipe card for Chicken Tika Masala, and it’s a dish I love to make. So, I’m familiar with what the spice blend used to prepare it, Garam Masala, smells like. 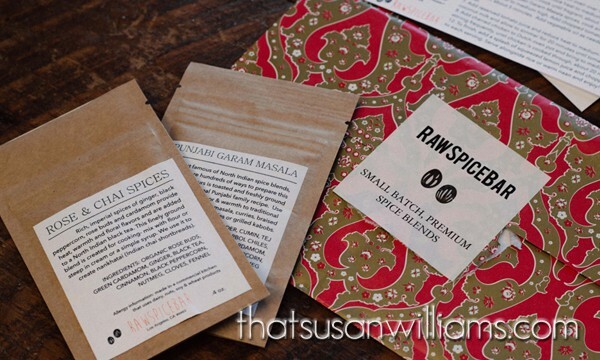 My nose was NOT prepared for the explosion of aroma that greeted me when I opened the small packet of Punjabi Garam Masala that was mailed to me in the February package from the Raw Spice Bar. I really was overwhelmed by its intensity, in the very best of ways. Freshly roasted small batch spices really DO make a difference! I served mine on ciabatta buns, this time. Next time, I’m thinking naan. When I began cooking the dish I chose to utilize this spice blend of Punjabi Garam Masala, my family came running, and began asking how soon dinner would be ready. When coincidentally, our neighbor called around the time I was cooking dinner, my husband, sure from the aroma that this would be a delicious meal, invited her over to share. Let’s just say that the smell of this spice blend cooking set all our taste buds to watering! Now, if you know me, you know that I am more than up for the challenge of developing my own recipe, rather than utilizing the recipe they sent me, so that’s what I decided to do with the Punjabi Garam Masala. February’s envelope contained spice blends typically used in Indian cuisine. My dear friend Sandy introduced me to Indian cuisine. Sandy has since passed away, but every time I make an Indian-inspired dish, I feel Sandy smiling at me. So this recipe is for you, Sandy. I think you would have liked it. My whole family sure did! The only change I would make is that next time, I’d serve it on naan, instead of ciabatta buns. We loved the raisins and the pistachios! 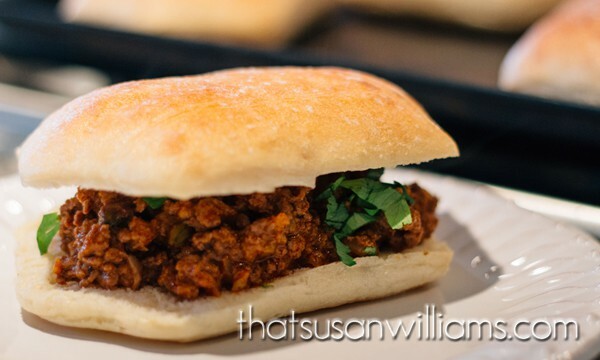 A delicious Sloppy Joe sandwich, with an Indian twist. I didn’t have the red bell peppers that Aarti’s recipe called for, so I chopped some celery and added that instead, and threw in an extra handful of raisins, to compensate for the sweet element that the red bell pepper would have added. I wasn’t sure about adding pistachios and raisins to a sloppy joe recipe, but everyone who ate this dish LOVED the pistachios and raisins, so, don’t omit them (unless you’re allergic). 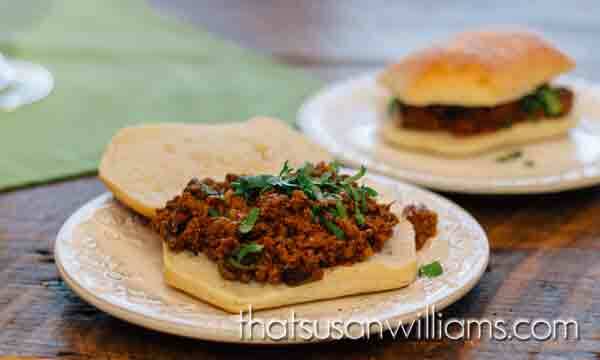 A jazzed up Sloppy Joe recipe that is inspired and enhanced by spices from India. Warm the oil in a medium saucepan over medium heat, until it shimmers. Add the garlic, ginger and chopped serrano pepper and allow them become fragrant, about a minute. (Don't let the garlic burn.) Add the garam masala and the smoked paprika. Allow them to bloom for about 30 seconds. Stir in the tomato sauce and water. Bring to boil. Reduce to simmer. Allow to simmer until sauce thickens, about 15 minutes. In a large skillet, warm 2 T. of oil. When shimmering, add the raisins and pistachios. Cook until the raisins swell and the pistachios become lightly toasted, about one minute. Remove them from the pan and set aside. Return the pan to medium heat, add 1 - 2 T. more oil. Warm till shimmering. Add cumin seeds and allow them to sizzle and toast, about 10 seconds. Stir in the onion and the celery. Sauté until they begin to become translucent and tender, for a couple of minutes. Season with a little salt. Add meat (whether venison, beef, or turkey), and break up the big lumps with your spatula. Brown until no longer pink, about 5 minutes. Once your sauce is ready, pour it into the skillet with the meat. Stir, bring to a boil, reduce to simmer, and simmer till mixture has reduced slightly, another 10 minutes. Finish with honey, half and half, and taste for seasoning, adding additional salt to taste. Stir in raisins and pistachios. Garnish with fresh cilantro. 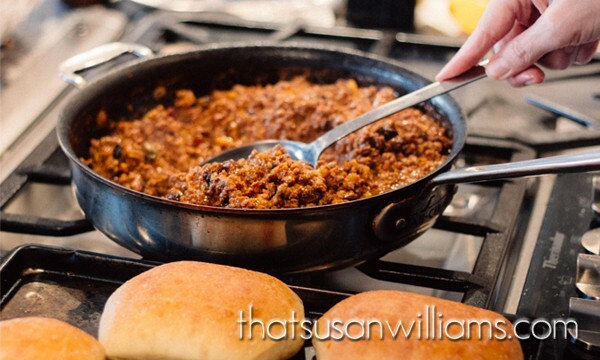 Even though I used venison, you can use either beef or turkey in this recipe as well. This recipe, although it contained a spice blend that is a little specialized, was not hard at all to throw together. Why not pin it on Pinterest? Or share it with your friends on Facebook, or tweet it, on Twitter.